Corn and Crab Chowder boasts corn fresh off the cob, lump crab meat and bit of heat (if you dare.) It’s creamy too…but, you’ll be surprised at the way this gluten-free and low-cal soup is prepared. At first taste, corn and crab chowder is sweet. As the chowder lingers on your palate and you’re savoring the sweetness, the heat kicks in. Shazowee! You wonder if you can take it. But, you are drawn right back for another taste because it’s so addictive. A makeover was in order, so we could all sit down and enjoy a cup of delightful corn and crab chowder together…at home. More corn. The soup is thickened with pureed corn and skim milk…or even rice milk…and it works fantastically. It has low-cal creaminess without heavy cream, flour, roux or even potatoes. Fresh corn is best…but, frozen works too! Fresh, sweet corn is absolutely my first choice for this chowder. If you go fresh, use this quick and easy method to microwave corn in its husk and easily remove the silky strands. But, defrosted, frozen corn works well too. Not a fan of crab? It’s very tasty with chicken too! I know…crab is a bit pricey and decadent. Got some leftover chicken? It’s delicious in this corn chowder. Corn and Crab Chowder has a bit of kick, if you want it to. It's creamy too...but, you'll be surprised at the way this gluten-free and low-cal soup is prepared. Add onion, celery and garlic to pot and saute for about 5 minutes or until soft. Add broth, salt, pepper, cayenne pepper, sugar and 1 cup of corn. Bring mixture to a boil then reduce heat and simmer for 5 minutes more. 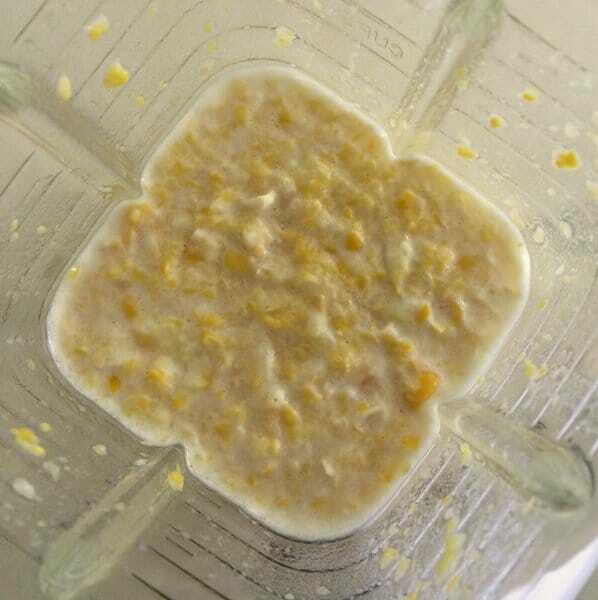 While soup simmers, combine remaining 2 cups of corn and milk in a blender and process. Mixture should be fairly smooth, but some corn kernels may remain. Stir corn and milk mixture into soup mixture and simmer for about 5 minutes more. Add crab meat to chowder, being careful not to break apart large clumps. This chowder is at the top of my to-make list. Summer fresh corn with crab (love both of them immensely). Ok…how genius to puree corn with skim milk to thicken the soup?!?! I love it! The sweet and spicy combo would definitely be a hit with me! Mmmm…..Crab is my favorite shellfish. Actually, crab is about the only shellfish I like, LOL This chowder looks fantastic! I love this! Crab and corn chowder is one my fav! I love that this is healthy!!! This is so up my alley! I love chowders… and I love the skim milk instead of cream tip. Yum! I love a bit of kick in my soups…so this is perfect for me! I love soups year-round…especially seafood soups! Two of my favorite things roller into one recipe — this I can’t wait to try! 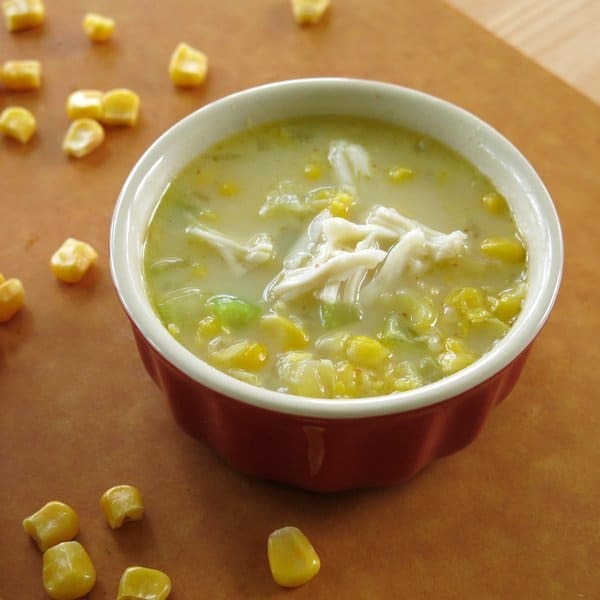 What a great idea to thicken the soup with corn! And I love soups that have a little kick of heat at the end. This sounds great! This soup is perfect for summer. You gotta love crab and corn together. Pinned. This looks OUTSTANDING! I love chowders! I will be making this with leftover rotisserie chicken for dinner…thanks for a super Summer supper that I don’t have to heat the oven! I make a corn chowder in a similar way! It works so well! I love corn chowder and crab makes this even better! What an delicious looking soup! I an loving that you added crab to it. Just beautiful! 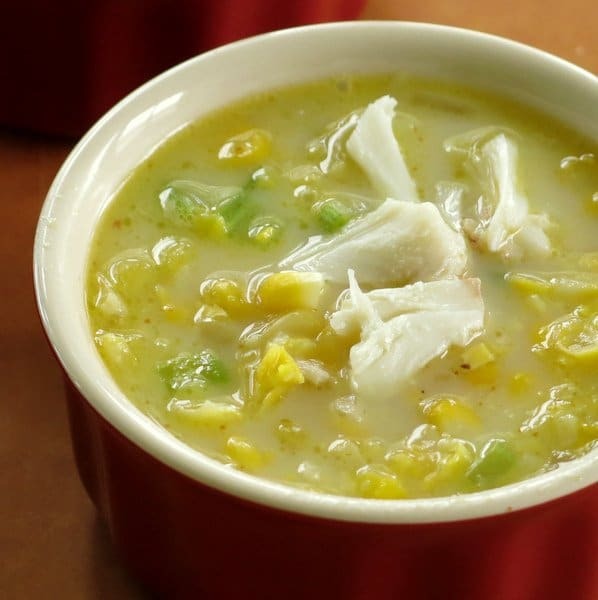 I have never tried a corn and crab chowder, but I know I need to fix that soon – it looks and sounds like the perfect combination! Yum! This is one of my favorite kinds of soups…such great flavors! This chowder looks so fresh and delicious…perfect for a light summer meal! Brilliant! I’ve thickened my chowders with mashed potatoes, but never pureed corn. We’ll be doing this next time! Looks wonderful…I love these kind of chowders…it will be perfect for a rainy night this summer! Can’t wait for corn to be in season, so I can make a huge batch of chowder! Seriously one of my favorite chowdahs! This chowder looks amazing! I love a lightened up version too! Thanks for the great idea! Last summer, I judged a crab contest and one of the dishes was a corn and crab chowder. It was so delish! Your recipe looks just as good, if not better! Must try! corn soup is one of my faves in the summer!! delish! 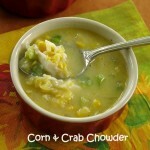 Corn and crab chowder is one of my favorite foods!! This looks wonderful! Looks like a wonderful comfort food! Love corn in the summer. I’m so glad it’s coming back in season. Looks delicious! What a great chowder! I love crab but like you said chicken would work too ad good to know you can use frozen corn as well! Yum yum yum! Crab and corn chowder is one of my very favorite soups! I could enjoy this year round! yum! This looks fantastic. My dad was a huge chowder guy, he would have loved this. Mmm Yum. It’s been awhile since I had a soup chowder. I need to fix that because your soup is making me really hungry for some. My husband is a huge chowder fan and would go crazy over this…yum! LOVE that you thickened this chowder with MORE CORN! I don’t think I could get enough of this. Crab and corn? Hand me a spoon, I’m digging in! This reminds me so much of the homemade soup my late grandfather used to make. Looks delicious! Well I can’t resist a good corn chowder and then to add crab? Top top notch!